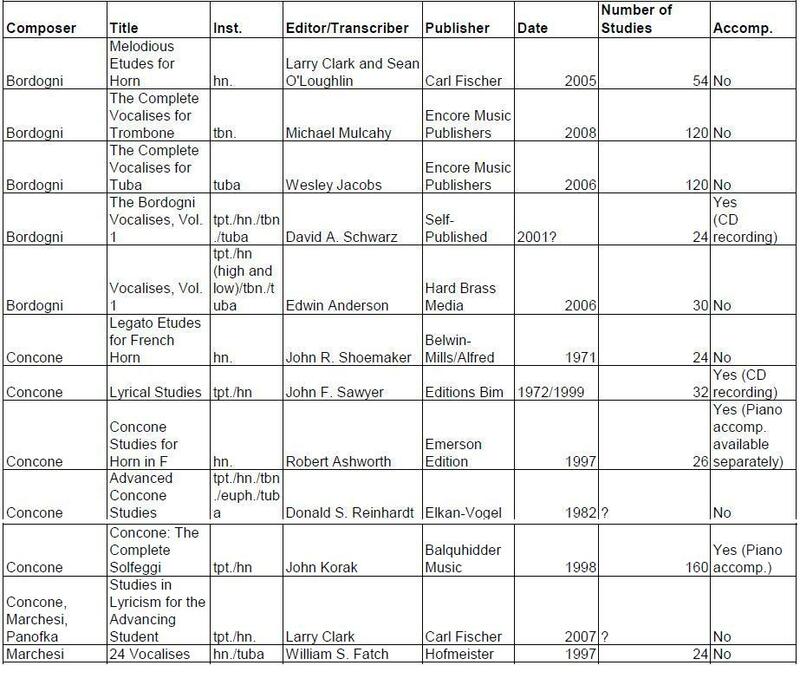 Of those included in this list, I am the most familiar with Melodious Etudes for Horn (Bordogni/Clark/O’Loughlin), Legato Etudes for French Horn (Concone/Shoemaker), and Lyrical Studies (Concone/Sawyer). I have used all of them at various times and for different reasons, and I like having a nice variety in my collection. You might also notice that there are a couple more names included on the list besides Bordogni and Concone. Both Mathilde Marchesi and Heinrich Panofka composed sets of vocalises, and these have also been transcribed for brass instruments. If I had to recommend only one volume of these, I would probably go with the Lyrical Studies (Concone/Sawyer) – it is very nicely engraved, fairly inexpensive, and appropriate for an intermediate level student. Now, on to a few ways to utilize these studies. In no particular order, here are some ideas. 1) Breath control/phrasing Try playing them at extremely slow tempos, just to see if you can do it. Try different/unusual breaths, for flexibility. I also like having students explain where they think the peak of each phrase is, and then have them come up with musical reasons for their choice. 2) Intonation: If you don’t own an edition with CD accompaniment, try playing each exercise with a tonic drone from a tuner or a tuning CD. When the piece changes key, just stop and change the drone to the appropriate tonic pitch. 3) Sight-reading: I like the earlier studies in particular for sight-reading practice because they are for the most part predictable. They are a great way for younger players to build confidence and develop their ear. 4) Developing a singing approach to the horn: One of the real strengths of these studies (and others like them) is that they can help us transcend some of the technical details of playing the instrument and instead focus on musical concerns. Along those same lines, Dr. Douglas Lundeen from Rutgers University has created an excellent presentation titled “A Bel Canto Approach to the Horn,” which he presented at the 40th IHS Symposium in Denver. I’m sure other teachers have various ways of using these studies, and I would love to hear about them! For some more information on this topic, check out this post by John Ericson at Horn Matters. In a recent correspondence, Dr. Ericson mentioned to me that he is working on an edition of the first twenty Bordogni etudes for publication in a low horn book due out in early 2011 – keep your eyes out for this publication, as it is sure to be a good one.